First Book Signing Event for Nip Nebs’ duo. First time author Susi Briggs and illustrator Ruthie Redden were captured on camera seeing their book for the first time. The friends had been working on the idea of the picture book for four years and were thinking they would have to self publish using crowd funding because of the story being in Scots. 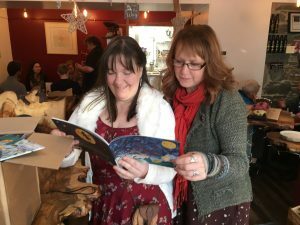 But Jayne and Shalla from Curly Tale Books were excited to see Ruthie’s beautiful art work at an exhibition during Wigtown Book Festival in October this year and felt the stunning pictures and the lyrical text were quite magical together. 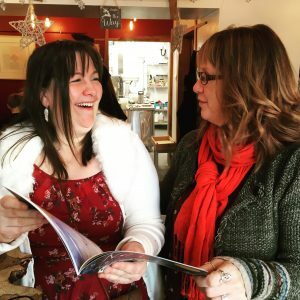 Although most books by traditional publishers are planned at least a year in advance, Jayne and Shalla approached Susi and Ruthie with the idea of producing the book by Christmas. It seemed like a tall order but with amazing team work they did it! Susi and Ruthie held their first book signing last weekend in Kirkcudbright and they have another signing at Waterstones in Dumfries on Saturday 16th December and a launch event at Curly Tale Books on Sunday at 2.30pm. Come along and hear the story of Nip Nebs. ← Nip Nebs Has Arrived!